https://c1.staticflickr.com/3/2781/32240937174_757efdaa55_d.jpg This little guy just loves to dance until he drops, but the wooden wall hanger guy can’ have that…. He won’ let anything drop, and so he hangs on tightly letting your keys stay safe and sound where you left them. https://c1.staticflickr.com/3/2918/32704455980_6501a23071_d.jpg https://c2.staticflickr.com/6/5593/31147384402_39a257d8a2_d.jpg comes with two types of key rings that lets you hang it straight off your bag and clip on your keys too. https://c1.staticflickr.com/1/396/32240936914_c24994a2d5_d.jpg Pure hand finished stainless steel complete with real leather tags provide a unique type of keychain with an added layer of style. https://c1.staticflickr.com/3/2885/32704455630_29d710d884_d.jpg Extra thick 2mm Stainless Steel provides the extra grip for the hanger. /Product Info/ Each wooden character is made from imported beech and comes with a strip of 3M double sided sticky tape that will stick to your wall and hold even the heaviest of key sets. The other character is made from 2mm stainless steel. /Story/ This little guy just loves to dance until he drops, but the wooden wall hanger guy can’ have that…. He won’ let anything drop, and so he hangs on tightly letting your keys stay safe and sound where you left them. 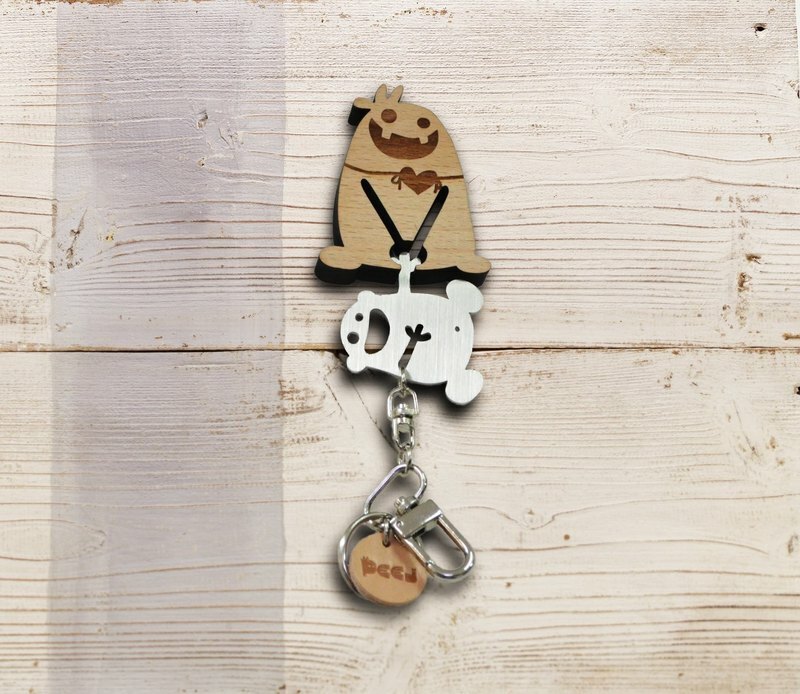 /Size/ Wood: 4.8 x 5.7 cm Stainless Steel: 4 x 4.5 cm /Materials/ Natural Beech wood, 2mm Stainless Steel /Brand Info/ “It’s the little things that make you happy” Our Peej family is made up of many characters, each with his own little story. The word ‘Peej’ literally means someone that can make you laugh. We hope that our little guys can do just this; to make you happy just by looking at them and to be the perfect accompaniment for your day to day lives. /Designer info/ Paul originally moved to Taiwan in 2000 and began his life here in education. After some time, he started designing teaching material for young learners and before long he realized that designing was the thing that he had come to love. And so came Peej: a natural progression which still revolved around the most important fundamental; making people smile. https://c2.staticflickr.com/6/5621/31255305256_ecb5e9d6cb_d.jpg https://c2.staticflickr.com/6/5560/30923536730_337b8e9b43_d.jpg When you order any of our characters or T-shirts, there will be a small gift in the form of badge or sticker added too. Made in Taiwan!